When replacing an existing ceramic countertop it is important to understand how the countertop was constructed before attempting to remove it. A typical tile countertop is built of three layers, the tile surface, a cement board underlayment, and a plywood subdeck. Prior to the availability of cement board, portland cement was troweled over wire mesh or expanded metal mesh which was stapled or screwed to the underlayment. The tiles are adhered to the cement backer board with thinset. The spaces between the tiles are filled with either sanded or unsanded grout depending on the width of the grout line. 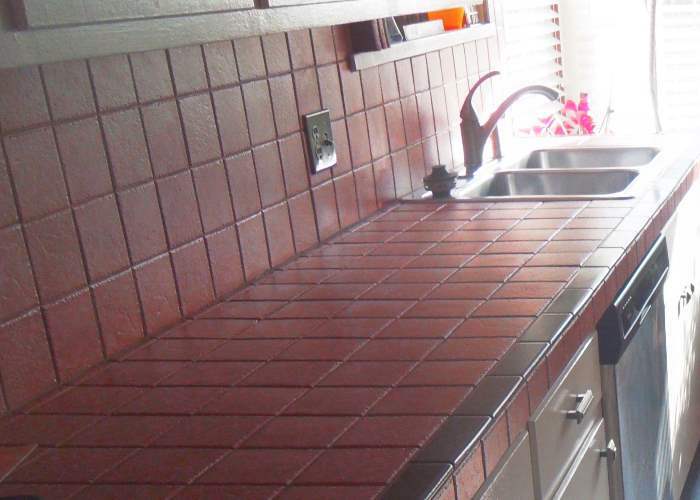 In some cases, the front edge of the countertop is capped with tile or banded with wooden trim. The cement backer board, if installed correctly, was also set in a bed latex modified	thinset to fill and level any surface irregularities on the subdeck. It was then screwed to the plywood, with fasteners placed every 6 inches. The subdeck, usually ¾” exterior grade plywood, may have been fastened to the base cabinets with nails or screws and in rare cases even with construction adhesive. It may be difficult to determine how the subdeck was originally attached since the fasteners are hidden by the tile and thinset. The countertops have may have to be removed layer by layer to determine how the subdeck is attached. In any case, you must proceed with extreme care when removing a ceramic countertop to avoid damaging the base cabinets.